Dr. Richard Castriotta earned his medical degree at the University of Bologna, Italy. He completed a residency in internal medicine at Yale University’s Hospital of St. Raphael in New Haven, Connecticut, and a fellowship in pulmonary medicine at the University of Connecticut Health Center, Farmington, Connecticut. Board-certified in sleep medicine, pulmonary disease and internal medicine, Dr. Castriotta’s clinical interests encompass all aspects of sleep medicine with research interests in post-traumatic hypersomnia, REM sleep behavior disorder (dream enactment), complex sleep apnea and hypoventilation syndromes. One of the pioneers in sleep medicine, Dr. Castriotta has directed sleep disorder centers for more than 30 years and has taught scores of physicians in the area of sleep medicine. 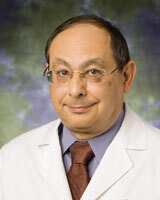 Currently, he is the Medical Director for Memorial Hermann Texas Medical Center Sleep Disorders Center and serves as director of pulmonary and sleep medicine and associate professor of medicine and pediatrics at the University of Texas Health Science Center at Houston (UTHealth) Medical School. He has held numerous leadership positions with sleep medicine-related professional organizations and has been listed in Who’s Who and among the nation’s top physicians. In practice since 1981, Dr. Castriotta treats all ages and speaks both Italian and German. His patient-centered practice philosophy combines evidence-based medicine with a conservative approach to medications. Patients get all the time and individual attention they need and deserve, with diagnosis and management plans based on science and accurate assessments. A resident of Avalon Place, Dr. Castriotta is married to an artist and the father of one daughter, who is a professional oboist. His favorite non-medical interests are opera, symphony, theater, hiking and birding. Dr. John Holcomb’s medical career was inevitable: his mother has a photo of him when he was five, wearing a stethoscope and checking on his younger brother. There was nothing in those early years to suggest that he would one day be on the other side of the stethoscope.